It is one of our most impossible human gestures to lean in – to trust, to love, without conditions, without knowing the outcome. This is especially impossible when there is already a story of fear rooted in our minds. One of the oldest, most primal instincts in us is to grasp. And yet nearly everything that matters comes out of these incredible, sometimes impossible, human gestures that require surrender. We have measured, researched, quantified and objectified nearly everything of this world and yet, when it comes down to the engagement of actually living, the lion’s share of our process requires unfathomable quantities of faith and unconditional love. It requires faith that what keeps us revolving around the sun, and evolving with each other, will continue as-is without end. And it requires love for all the times when exactly what isn’t supposed to happen, happens. Then happens again. This morning, I am in a place of more awe than ever before, for this thing we humans do when we live from a place of love – when we have Faith. When I say ‘faith’ I am not referring to the small purposefully controlling belief system that our lives, our well-being, are in the hands of an extraterrestrial old white man in the clouds. I am referring to the trust and devotion that comes from recognizing the inestimable (sometimes barbaric, sometimes horrific) genius that is behind everything that is happening in the world at this time. I do not speak about this from an arm chair my friends. I am as far out on this rocky ever-shifting peninsula as a human could be, the barbed teeth of fear, rage and numbness biting at my ankles; my ventricles being tickled by the tongue of that charismatic carnivore I told you about yesterday. And yet from here, from this very place, I want to tell you a few more things. I want to invite those of you who believe I enabled my son in his addiction to heroin, to lean in a bit further and listen for what is truly necessary here. We are not taught this. I don’t know how I came by it. But what is needed here is faith and uncompromising love – RELATIONSHIP. I want to ask you to lean in and listen to this love story. Had my son not wanted, desperately, to get himself off heroin we would have had a different conversation. He would not have been staying in my home and we would not have been sitting at the table talking (at times in a way that could appear casual to the one not privy to what was roaring in this mother's heart) while he carefully cooked heroin and injected it into his arms. At his initial intake appointment, had the clinic not said, “Okay Henry. Great to meet you. Now come back in five days and we’ll get you started on Suboxone” we wouldn’t have been having that process. In order for Henry to keep his job, and therefore what was left of his ever-eroding sense of purpose and worth, not to mention his apartment, he would have to stay, in some manner, on heroin for five more days. After we got that news, we sat at the kitchen table, where so much of our living happened over those few weeks, and plotted the necessary course. He figured out that .5 gm of heroin a day would only have him in a mild withdrawal, not the dysfunctional depths of it, while not being enough to feed his habit further. That night we went to ARC and got him a package of fresh needles. Then I took him to the place where he would meet a friend who could sell him the 1.5 gms that would last him until Sunday morning when he would have to stop using so he could be 24 hours clean to start Suboxone. "The last 1.5 mgs of heroin I will ever do," "This is the fourth to last time I will ever shoot up," he would say to me. That night, after he got home, he divvied the heroin up into three packets, labeling each of them with the name of the day it was to be used. 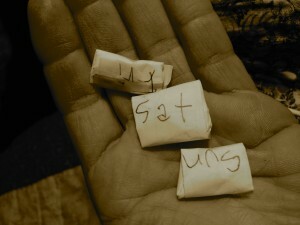 He gave them to me saying, "Mom, hide these somewhere and only give me the packet for the particular day we're on." Our culture does not have a clue how to deal with addiction because we cannot afford to admit that the culture itself is most often the cause; that we create addicts in the way we raise humans without purpose or initiation. We cannot find the language or courage to speak about the fact that addiction itself is not the problem. It is merely a symptom of the fact that we have lost our language of the soul, which is the only language that can speak to the addict’s true process or the human's true longing. The addiction is simply the best-found solution the addict can find – the only momentary cure for the alienation, despair, pain, rage and more – in the process of simply being human at this time. In order to preserve the fallacy of our culture, we must pathologize the individual here, sending them away from their lives and their community for treatments that don’t actually work (the Twelve Step program has a 5% effectiveness rate). We shame or we cajole or we reject or we plead. For me, it was a fine line (and I live under no fallacy that I have gotten a single thing ‘right‘ here) between loving my son with increasing fierceness each moment of this process, and standing unequivocally in my declared truth that it is unacceptable that Henry use heroin. But it was clear that whatever experience allowed him to say ‘yes‘ to heroin would only be challenged through deeper and more intimate relationship with people who mattered to him. Through increasing experiences of Love and witness. That meant leaning in and staying in. I could write volumes describing the ten days my son lived with me and we both lived with heroin. But the specific experience of sitting with him, insisting that he shoot up in front of me, that he not split off the addict from the young man, that he feel the full weight of his choices with his mother as his witness, these moments were by far, the most exquisite, meaningful and impossible of all of them. And, in the end these moments were the ones to help him so clearly choose a partnership with sobriety, a commitment to his own soul and the unknown of that treacherous terrain. If the unmet longing of the addict is, in part, an expression of our basic human need to matter, to be of consequence, to be seen by our people, to be loved, then what better an antidote than being utterly seen while, or perhaps even despite, being a drug addict? In those moments, the only relevant question I could find to hold myself accountable was, “how can I love this young man more deeply and fiercely in every moment and trust, have faith, that love is the only thing that will save him?” Surely love is the only thing that has the tensile strength to lure a person from the grips of addiction with the promise that what might be waiting for them in the terrifying unknown of truth is far greater than what they have found, so far. Henry’s path is absolutely uncertain, as is each of ours. To imagine there is a right way and a wrong way is to make one of the biggest mistakes a parent can make. It is the job of each child to initiate themselves into adulthood. it is the job of each adult to help facilitate this. It is the job of each child to surpass her elders, to render them obsolete with her brilliance and her unique never-before-seen capacity to have faith in, and love for, the world around her. Most of us will not recognize this brilliance. It will appear as a threat, a criticism, or simply the naiveté of youth best soon grown out of. We imagine we know the best path to their genius, and that we know what their genius will look like. We believe it is our job to teach them by telling them. But we can only tell them what we already know. And what we already know is, of course, already too old by the time we utter it. I cannot say that heroin is bad. It is, as a path, a death sentence. But even that might not be for me to judge as ‘bad’. I can fight for Henry and insist he get sober, but I have no actual power here. It is not my life. And who am I to imagine I know the course of someone else’s path? It is my job to simply help him discern his path and then help him stay devoutly on it. Even now, as I sit here with a broken-open heart, feeling the impossible weight of my son's lived experience, I cannot honestly say whether anything is ‘good’ or ‘bad’. Just because I’m feeling a thing I’ve decided is pain does not mean something has gone wrong. I can only say, “yes...I am paying attention here.” I can only commit to breathing deeper and feeling the pain of heartbreak – just as much an indication of a fully alive Life – as the awe of the blackbirds and their heart-piercing cries above my head in the cottonwood. I cannot do anything other than insist I pull the breath into my lungs, like I pull Henry to me, and hold it there long enough to taste where it has been, whose lips it has already kissed, whose fur it has ruffled, which raptor it has carried, before sending it back out into the world with my unending gratitude for the uncompromising way Life insists on itself. Addendum: As I write this Henry has gotten his second promotion in three weeks. He is working out and hiking, creating music again, finding his humor, his spirit and reawakening his particularly stunning unique way of being human. But Suboxone is not a treatment plan. It’s merely a holding tank. If Henry is a few hours late with a dose, the roaring urge to use heroin comes right back. Next steps will include exploring the paths to profound encounter with soul – the only thing with the true and lasting strength to dampen heroin's allure. For now however, Suboxone is giving him a chance to feel like a normal young man for a time. To gather himself up and take stock. He is engaging with the world, feeling ever-more confident that he has something of value to offer. But his is a moment-to-moment journey. Which of course, is the rest of ours, too.